(Bloomberg) -- The fallout from California power giant PG&E Corp.’s looming bankruptcy has been both sudden and widespread: Its electricity suppliers have seen their debt cut to junk. Banks are facing liabilities as buyers of last resort for more than $760 million of bonds the utility issued through California. And the rest of the state’s utilities have tumbled. Now the U.S. government has become entangled in PG&E’s financial crisis -- brought on by deadly wildfires that tore through California in 2017 and 2018, saddling the company with an estimated $30 billion in liabilities. That’s because the U.S. Energy Department has backed renewable-energy projects contracted to supply power to PG&E with a total of $8.3 billion in loans and loan guarantees. And a bankruptcy filing -- which PG&E plans to make as soon as month’s end -- threatens those power-purchase agreements, along with several others signed years ago when green-power prices were much higher than they are now. PG&E could argue as part of its restructuring that “resetting these contracts to at-market level could create more headroom for bill increases and rate base growth, effectively increasing the value of the estate,” Citigroup Inc. utilities analyst Praful Mehta said in a report this week. The Energy Department loans underscore just how extensive the fallout may be from PG&E’s collapse. 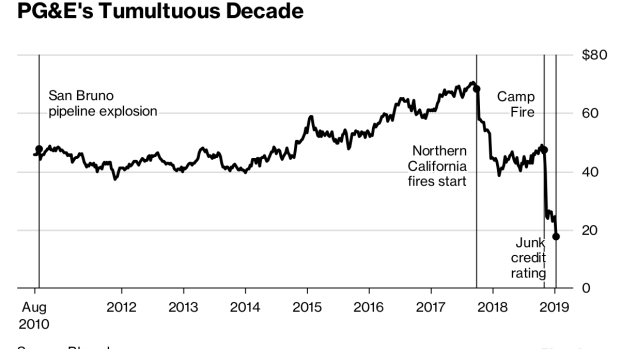 While investigators are still probing whether the company’s equipment ignited the deadliest wildfire in California history in November, the crippling liabilities that may result from that blaze has wiped out almost 90 percent of its market value. The crisis also puts the federal loan program back in the spotlight several years after it earned a black mark by backing Solyndra Inc. before the solar manufacturer went bankrupt. The agency declined to discuss the PG&E situation. It also declined to disclose how much of the principle on the loans or guarantees granted to PG&E-contracted projects had been repaid. But of the $32 billion in loans and loan guarantees the agency has issued, $9 billion in principle had been paid back by September. It had collected $2.4 billion in interest. BloombergNEF analyst Ethan Zindler said “it would seem unlikely” that PG&E would abandon the contracts given how focused California is on curbing greenhouse-gas emissions from power plants. But a court could also require generators to just keep selling the company power “even if PG&E isn’t paying,” according to a note this week by Michael Weinstein, a New York-based analyst at Credit Suisse Group AG. --With assistance from Hannah Recht.